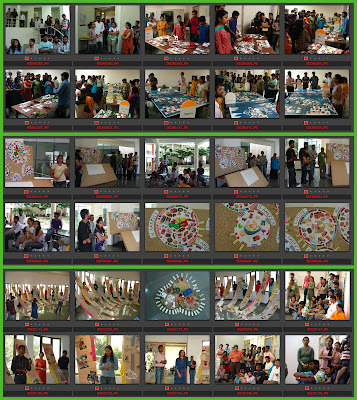 Image 1: DCC models about food at NID Bangalore: Climate, Geography and Culture. I have been in Bangalore, nay Bengaluru now, for over ten days and have been conducting the Design Concepts and Concerns Course (DCC) for students of three disciplines at the NID Bangalore Centre. The theme continues to be food and the assignments have gone through a small transformation. The first assignment had three groups looking at the macro aspects of food and the economy across the broad fields of influence under the heads of Climate, Geography and Culture. The first assignment ended with the three groups having explored the chosen areas through brainstorming and some supporting research ending in the production of a visually rich model that could help in the “visual sensemaking” process as defined by the NextD Leadership Institute. Each group came up with compelling presentations that revealed a great depth of information carried by the team members and they were all able to produce rich models and make their presentation to the faculty and students at NID Bangalore. The Geography group used a compact model of the continents which revealed both their knowledge as well as their areas of ignorance about the world of food, since the North American and European regions were better represented than the South Americas and the African continent. The climate group divided the world into zones along the longitudes and used one table surface for each zone to capture a picture book of “Poloroid pictures” just as a returning traveler would have shared their vast journeys with their clansmen in the past. The third group had everyone holding their breath with their stunning portrayal of culture using their knowledge of India and the variety of foods and their associations with religious and cultural affiliations. The three dimensional display was well classified and translated into banners each that covered one major category of food and a central display mapped the three major religions that dominate the Indian landscape. Image: Neelam Chibber with Prof. Ranjan at NID Bangalore and with students of the DCC class. Neelam Chibber who visited the NID campus briefly to see the bamboo workshop at IPIRTI across the street from the NID campus was quite taken in by the presentation of the culture group and she has commissioned the team to make a refined set of banners about food and culture for her new stores in the now revised Industree Crafts stores that are taking shape in her back office operation of scaling up and diversifying her already successful operation to bring value to Indian crafts at the grassroots level. The Industree Crafts Foundation as well as Industree Crafts Pvt Ltd is being transformed after taking strong roots in Bangalore and I will bring this story to this blog when Neelam is ready with her new and revised offering. Industree Crafts Foundation and the business wing Indistree Crafts Pvt Ltd. works on a Fair Trade principle with over 15,000 village craftsmen across seven states and the Northeastern Region of India and it grew from a small investment of Rs 12 lakhs (1.2 million Rupees) to reach a valuation of over Rs. 15 crores today and growing further by the day. Neelam worked with Gita Ram of the Crafts Council of India and Poonam Bir Kasturi in the early days to nurture a lofty thinking organisation and has shown us that design and social equity can bring good value for all partners. You can download a pdf article about their Fair Play principles from this link as a 688 kb pdf file titled "Fair and Just". The Swiss design team of industrial designer Frederic Dedelley and design journalist Ariana Pradal conducted a one day sensitizing workshop for all the students at NID Bangalore when they shared the Swiss Design experience through a slide lecture which was followed by a hand-on workshop aimed at creating a designer Letter Opener by direct action on materials and ideas. The evening saw an exciting presentation of over 50 different design offerings which were stimulating and showed the students the dominant design activity of product diversification with the use of micro detailing and form giving that are central to a designers bread and butter operation in their dealings with industry. 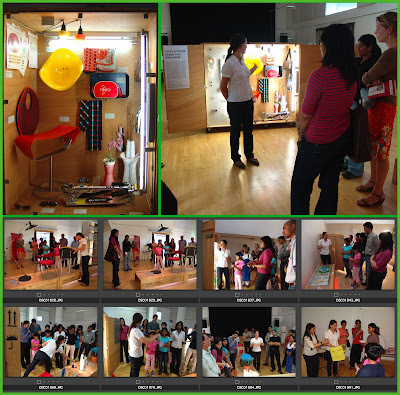 Image 4: Guided tour at the Swiss Design exhibit at Bangalore Max Muller Bhavan. I got to visit the Swiss Design exhibition, Criss+Cross at the Max Muller Bhavan in Indra Nagar and also to take the guided tour offered by Ariana Pradal. I was joined by my daughter, a Bangalore based Graphic Designer, Aparna Ranjan in this very informative tour and later we sat together for a long chat with Frederic Dedelley on various issues and directions in design for India and the world. 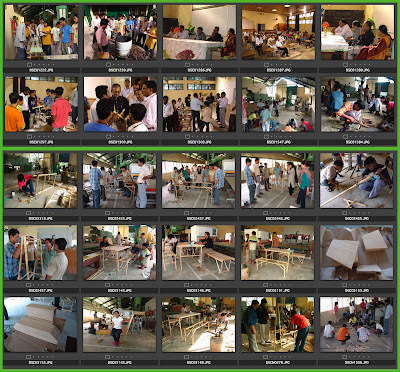 Image 5: Bamboo workshop at IPIRTI with Tripura craftsmen for the IL&FS project. The IPIRITI based bamboo development workshop had nine craftsmen from Tripura along with two of our mastercraftsmen working on my new designs that used a combination of bamboo poles and rubber wood components under the supervision of NID Bangalore faculty and long time bamboo colleague, C S Susanth. The IL&FS team included a supervisor and their senior officer S Matouleibi who manages the field activities of the Tripura Bamboo Mission in Agartala, Tripura. We developed a collection ten new designs with a focus on a “local-to-local strategy”, where we selected products that would have a ready local market in the Tripura region which in turn would facilitate start-up entrepreneurship amongst the bamboo craftsmen who need to develop their self confidence through some mentored development initiatives by the design and finance teams in the field. 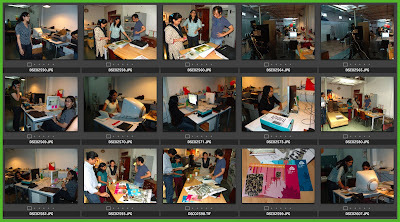 On our return from our long drive to Quetzel and back I took Matouleibi to visit Trapeze, a graphic design studio at Koramangala which was set up by two NID graduates, Sarita Sunder and Ram Sinam. An exciting small studio with a row of Macs on one side and an impromptu photo studio and a table tennis facility on the other. Trapeze has an impressive range of clients from across several sectors and their work in print and web design has set standards for Indian graphic design industry in spite of their small and cozy studio size and very personalized format of operation. 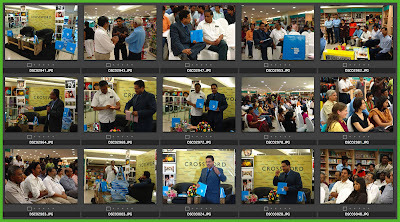 Image 8: Book launch function at Crosswords for Dr Darlie O Koshy and his book “Indian Design Edge”. The week closed with another interesting event which I will write about in some detail in a future post since it will need the time and space to read, reflect and comment about, in a balanced manner, if possible. 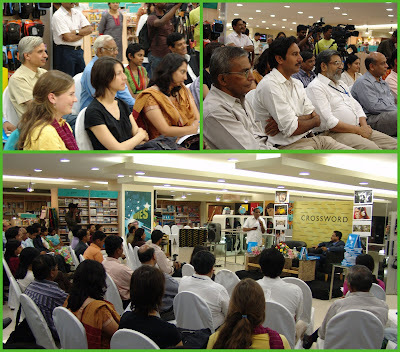 This event was the launch of the new book, “Indian Design Edge” by Dr Darlie O Koshy, Director, National Institute of Design through the Roli Books Publishers at an evening event at Crosswords Bookstore on Residency Road, Bangalore. The event saw the main speaker Dr Sadagopan, Director IIIT, Bangalore (Tripple IT Bangalore) wax and wane about the virtues of design from the aesthetics to the usability of the Apple iPhone and his profuse praise for Dr Koshy’s many achievements in his 8 year long career at NID as its Executive Director for the first five years and later as its Director for the past three years after a terminiology change that has left us all puzzled if it is a move forward for NID or not. I bought three copies of the book for myself, my wife Aditi Ranjan and my daughter Aparna Ranjan so that all of us designers could come up to steam quickly on Dr Koshy’s offering to the design publishing space in India, which by the way is very starved of any kind of serious publishing and this particular offering will be lapped up by the much starved Indian and international design public, I am sure. Dr Koshy is also a Board Member of ICSID, the International Council of Societies Industrial Design, and by the way my blog “Design for India” has been showcased by the ICSID blog in the education section last month particularly for the Tata Nano debate that it had hosted when the product was launched with much fanfare early this year. Ratan Tata has written the Forward for Dr Koshy’s book and the Tata Nano appears on the dust jacket as well as on the contents page of the book as a symbol of Indian design success. There was a bash across the street from Crosswords organized by a local fashion group to falicitate Dr Koshy on his publishing achievement but I did not gate-crash this bash at the Taj Gateway but chose to have a quiet dinner with my daughter Aparna along with two very interesting young designers from France and Germany, two girls who have chosen to work in India since it offers them real challenges unlike the well established and stable design climate in Europe today. We sat a Coconut Grove and got a sense of what foreign designers liked in India and how they had coped with the challenges of Indian living, both rode mobikes in Bangalore and have worked for over two years in a umber of very interesting assignments here in Bangalore. I am sure India can accommodate may more such international adventurers in the 230 sectors of our economy that is today starved of design offerings due to policy myopia in government and in industry. The design scene in India is indeed changing rapidly and this si an exciting time to be working in and in writing about design for India. Mireille Arnaud, the girl from France, is working with some stone craftsmen from a village called Shivarapatna in Karnataka and she has helped them build contemporary concepts that can take their skills to new markets in India and overseas. This is the kind of cooperation that we had envisaged when Aditi and I had embarked on the research for the book “Handmade in India” in conversations with Jogi Panghaal one of our prominent collaborators and several of our faculty colleagues at NID. India can offer creative opportunities of Indian and international designers to work closely with Indian craftsmen to build a creative economy which could be the future for many of the Indian crafts if our policy initiatives are managed in the right direction. On the other hand, Christina Hug from Germany, is working as a creative director in a local design firm with her focus on graphics and communication having traveled to India after field experiences with the Greenpeace Foundation in many countries. This week I get back to NID Ahmedabad with a good feel from Bangalore since so much has happened the past ten days and the stay was useful and productive. I look forward to returning soon to Bangalore, the city of Rain Tree avenues and a still wonderful climate, if we manage to keep it that way, Nano or no Nano! Starting with some early projects for the Space Applications Centre and some Textile Mills at Ahmedabad in the early 60’s the first major exhibit to be assigned to NID was the Nehru Exhibition. Charles and Ray Eames designed this exhibition with their office team working along with the young NID team at Ahmedabad. The Eames Office teams located themselves at NID for a few months while the research and design of the exhibition involved the young NID students who learned on the job from the world masters. These students were the first batch of Graphic Designers being trained at NID who later became the first faculty group of the Institute. The Nehru Exhibition traveled the world and I too was involved in these projects in New Delhi in 1972 and later in Santiago, Chile in January 1973 and much later in the early 90’s when it was set up once again as the much enlarged and permanent “Discovery of India” exhibit at the Nehru Centre in Bombay. All these projects were done by the faculty of the time and students from several disciplines were involved as project associates, each with a specific design assignment from which they could learn by doing. 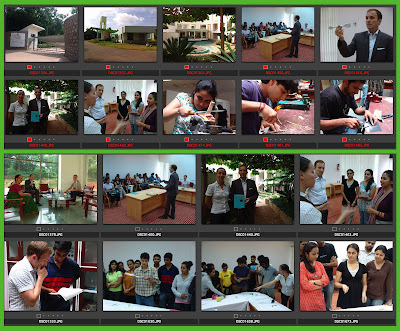 “Learning by doing” was the slogan of the day and frequent project meetings ensured that all members got to learn about the problems and achievements of all the other teams that were handling the diverse tasks to be completed in time and at the highest quality standard, insisted upon and set by the international consultants as well as the faculty teams at NID. Such projects in those days brought in the money needed to experiment freely with expensive materials and tools within education and the Institute would be buzzing with activity through the day and the night when deadlines got tough and the learning was taking place in a rich soup of activity and dialogue associated with these projects. These experiences also brought in many specialist experts such as copy editors, photographers, typographers, calligraphers, artists, illustrators, lighting, media and structure experts, all masters in their respective field, and their visits to the campus as well as at work locations in many fabrication shops where the various exhibits were being fashioned gave live exposure and experience to the students, and all of this was based on the design schemes proposed by the teams from NID. Image: NID's heritage campus as seen from the lawns was the scene of all the activity mentioned in this post. Today two new campusses have been set up at Gandhinagar and at Bangalore. In the late 70’s exhibition design was offered as a discipline for the SLPEP Programme which was then five and a half years duration with a one and half year foundation programme. 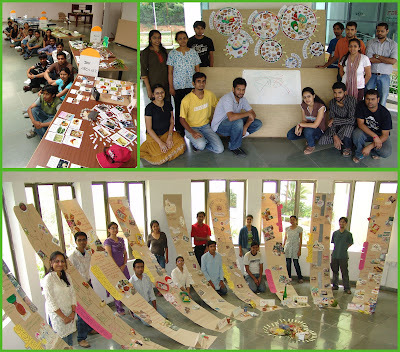 Dashrat Patel headed and conducted the discipline with Pradeep Choksi as his faculty assistant during the first few years, but whenever major exhibition projects came into the Institute, students from all disciplines were involved as team members and everyone got the multidisciplinary exposure. The landmark projects handled in this period included the Our India Pavilion in the 1972 IITF Trade Fair with huge multi-screen projection systems executed with technical and multimedia experts from Czechoslovakia, the Textiles of India Pavilion for the Ministry of Textiles and the Nehru Exhibition, all of which opened on the same day in New Delhi in November 1972. The first batch of NID’s SLPEP Undergraduate students were all involved in these three projects and the learning was truly through the doing as was professed in those days as the educational philosophy of the Institute. The exhibition design education programme was suspended for a few years and then offered again through popular demand from students wishing to explore several materials as well as media, message, structure and form. 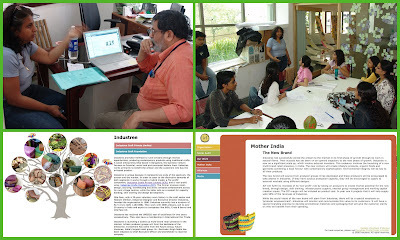 The exhibition design programme flourished under the leadership of Vikas Satwalekar who took personal interest in the activity while he was the Executive Director of NID from 1988 to 2000. Included in these is the Rta Rtu exhibit for the IGNCA in New Delhi and the Discovery of India exhibit in Bombay besides a regular education offering at NID and a rich crop of graduates from the discipline, all with great leadership that was revealed by their work in the field since then. The major projects handled in the early days included the Agri-Expo in 1977 under Ashoke Chatterjee’s leadership, the Manipur Pavilion and the DST Pavilion in 1981, Energy Exhibition in 1983, and the Commonwealth Institute Exhibit in London during the Festival of India in the UK. The other period of major projects included My Land My People for the Festival of India in the Soviet Union under the leadership of Vinay Jha between 1985 and 1988 when he was the Executive Director of NID. Two major museum design projects were already under way when Dr Darlie Koshy took over as the Executive Director of NID in 2000, the major museum project for the Reserve Bank of India and the Khalsa Heritage Museum for the Government of Punjab. While the first museum was completed and delivered in Bombay as a very high quality offering the second ran into political trouble of many kinds. However, the Khalsa project ran into all kinds of delays and the project has now been handed over to a team of NID graduates who are now completing the project since both Vikas and Suranjana Satwalekar moved out of NID after his retirement as a member of the NID faculty. 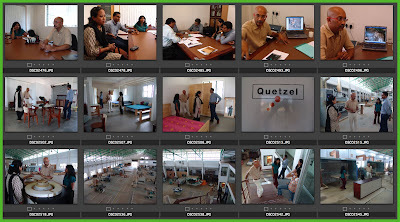 However NID shifted its focus from “hands-on” production of exhibits to outsourced production and student involvement in these projects dwindled to a very small and infrequent involvement due to policy changes in education and professional practice at NID. The “Hand-on Minds-on” slogan that I had coined – for our bamboo based elective using three species, kanakais (affinis), strictus and giganteous, each from Tripura, Madhtya Pradesh and Karnataka respectively – in November 2003, which was later borrowed and adopted wholesale by the institute across many of its publications and external communications. However, in the real actions that followed the slogans, the hands-on seems to have lost out to an intellectual research focus, which saw the workshops at NID shrink in size, and activity and the student population soar in numbers across all the specialized disciplines at NID. Exhibition design once again stuttered from lack of conviction in the multidisciplinarity being at the core of design education and many narrow specialisations were launched in the claim that these would bring greater depth of research to the specific fields. Only time will tell if this will happen and I have my doubts, which I have expressed at many occasions. We need to review the design history of our exhibition design education and practice and draw the lessons from these experiences since they were not just professional projects being carried out in a pure design office but they were truly rich training grounds for young design students who were exposed to live experiences across a multidisciplinary environment in a climate of high motivation, optimism and a high quality commitment. This kind of learning is unique to NID since professional projects were brought into the classroom and these tested the mettle of both faculty and students alike. It is not surprising that so many of our graduates occupy leadership positions in their careers across many sectors of the Indian economy and we should use these reflections to see how design education can and should be strengthened in a live manner in the days ahead. Unfortunately, as with so many other design schools around the world NID too suffers from a lack of process documentation of its work and experiences. This may be a good moment for us to rally our faculty and students as well as those who have recently retired from service to try and use the web based platform to document and garner all these experiences in a way that will give us insights that would help shape the future of design education when India is finally recognizing the need for this kind of training and the national policy is geared to set up several schools all over India. What models should they follow? Surely not the route followed by the schools of architecture and technology but perhaps that which has been adopted by the schools of medicine where practice is at the heart of education, “Hand-on Minds-on” all the way. Yesterday two students met me in my office to ask me questions about the history of the NID’s exhibition design programme and in my response to their questions many insights and experiences flashed through my mind, which has led to this paper. Next week NID is organizing a very interesting meeting under the leadership of Gira Sarabhai who from her museum design and management experience coming from the setting up and running of the Calico Museum of Textiles in Ahmedabad has asked NID to explore the need and structure for a proposed new programme on the conservation and management of the textile and museum heritage of India. Aditi Ranjan, Head of Department of Textile and Apparel Design at NID is coordinating the meet on the 18th and 19th September 2008 with international and national experts meeting together with design educators and this I am sure is a great opportunity to reflect on the NID experience in museum and exhibition design. I will unfortunately miss this event since I will be on my way to Bangalore for my two-week course in DCC for the NID Bangalore students as well as our bamboo project for the IL&FS and the Tripura Bamboo mission for whom we are conducting at the IPIRTI campus located across the street from the NID campus. However I do hope that the meeting will sift through the vast NID experience and integrate this into a rich palette of inputs and insights for the future of design education in India. 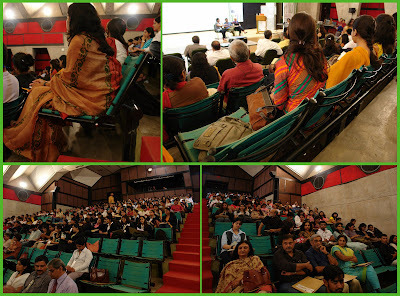 Image: SID Conference on “Interior Design Traditions” in progress at the Ravi Matthai Auditorium at the IIMA. It was good to see my auditorium chair design in use almost ten years after they were designed and to see that the canvas fabric has aged gracefully, just like a well-worn pair of jeans. 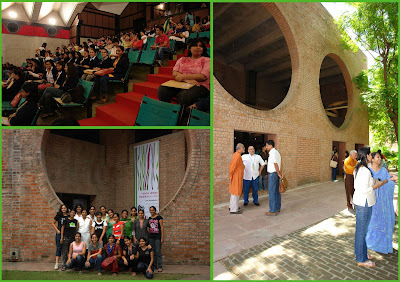 A three-day conference on “Interior Design Traditions” ran its course at the Ravi Matthai Auditorium of the IIMA from the 31st August 2008 to the 2nd September 2008. Theory of design, Reflections on design practice and Case studies and Retrospectives from distinguished practitioners from the field of Interiors and Architecture dotted the proceedings. Some of these presentations were by the first generation of graduates from the School of Interior Design coming back to share their experiences for the first time with their Alma Mater and with students and faculty from a large number of schools of design assembled in this third conference in the series. Image: A large contingent of students from Pune in blazers and in a group photo outside the hall. Faculty and students interact during the tea break. The visible group of participants was the large contingent from the B.N. College of Architecture since all the students came in uniform, wearing the school blazer, and sitting in a group giving the conference a very corporate look. The other big group was of course from the School of Interior Design itself and being the organizers they were all active as both organizers as well as participants with a high degree of motivation. The next vocal group of students was from the Indian Institute of Crafts and Design from Jaipur who asked questions in most of the sessions and generally played an active participant role during the event. The auditorium was quite full and the three days saw a high level of participation both inside as well as outside the hall. 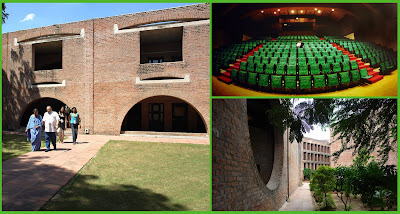 Image: A panoramic view of the IIMA Auditorium interior from a display photograph in the corridor and views to the left and right of the main entrance lobby showing the administrative block and the main building of the IIMA in the distance. Three days and ten sessions in all was quite a handful, not all of it was interesting but some presentations made the conference really worthwhile. Presentations by Aman Nath and Ratan Batliboi were particularly stimulating since they drew from their life experience and shared insights and achievements that were substantial contributions to their field. Nath shared the Neemrana Hotels story with the underlying philosophy of heritage conservation that goes back over twenty years when the first hotel was established by the conservation and reuse of the dilapidated old fort, the Neemrana Fort and since then the same methodology has been repeated over thirteen times at various heritage locations across India, all done through the private initiatives of Nath and his colleague working as concerned and motivated entrepreneurs. Nath called it passion to conserve. Ratan Batliboi shared the work of his office, starting from humble beginnings from a small studio; the office is one of the leading architecture and design houses in India. The work, which started with small domestic buildings, have grown to include hi-tech networking centres to over 35 railway stations in New Mumbai and New Delhi for the Dwarka – Delhi metro system. The insights from these journeys were inspiring and do give the young student participant a sense of confidence in their own ability to change the world, if they so wished to take this path. The other interesting presentations included those by Prof Uday Athavankar on the Crisis in the Indian Identity which dwelt on the theory and insights from his product semantics research in India, and another by Jacob Mathew from IDIOM spoke on the Changing Face of Retail based on his considerable experience of working with Kishore Biyani and his Pantaloon and Big Baazaar group of companies. Two other presentations that held my interest were made by SID alumni Vishal Wadwani who has done interesting work on modular light weight structures and the other by Vaibhav Kale who has now set up a company to explore bamboo architectural structures in the area of low cost housing. 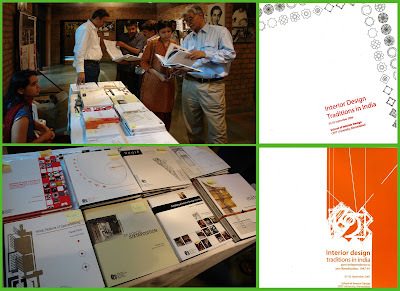 Image: Sale of books and research publications from the School of Interior Design at CEPT University, Ahmedabad. This exhibit drew as many enthusiasts as the main conference. On the right are the cover pages of the two conference proceedings from 2006 and 2007 and at the bottom are the major thematic research publications from the SID Research Cell. While many more presentations went on in the hall as the conference progressed the SID research and publications counter drew my attention. Located outside the conference hall, this counter offered another kind of excitement. The SID had on display some of their student works dealing with Indian Traditions, which is the theme of the three conferences over the past three years. However the real excitement was in their publications that were on sale all through the three days at their sale counter facing the display of Ravi Matthai’s photographs in the entrance lobby of the IIMA auditorium. For me it was particularly stimulating to see these research publications since I have been actively championing the production of such publications at NID and calling for such an active programme from other design schools in India. It seems that the SID in Ahmedabad has taken a huge lead over all their counterparts when we look at the quality and content of the research publications that they have on offer and with more in the pipeline. In India, we now have as many as 25 design schools (if not more), 150 + schools of architecture and as many as 900 + schools of engineering and technology, but few of them can boast of a publications programme that can match the results shown by the SID in Ahmedabad. I do hope that some of the schools will take a leaf out of the SID agenda and get their own faculty and students to publish more effectively in the days ahead.